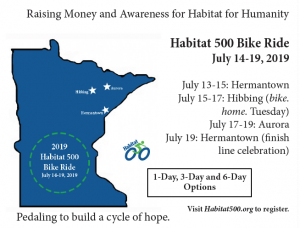 Looking to spread the word about the 2019 Habitat 500? Share the Habitat 500 Postcard! Click here for a single copy (ready to be placed into an email) or here for a printable PDF for your own mailing! Overnight Town Information Coming Soon!